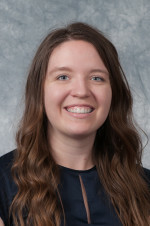 Samantha earned a Bachelor’s Degree in Spanish from Willamette University and later completed her Master’s Degree in Speech Language Pathology at the University of New Mexico in 2016. Prior to joining PRC in the fall of 2017, Samantha served as a Speech Language Pathology for a Colorado private practice specializing in Augmentative and Alternative Communication (AAC). While there, she completed AAC evaluations and provided ongoing therapy in Spanish and English for children and adults with a diverse array of speech and language disorders. Her passion lies in supporting individuals to use AAC as a tool that fosters inclusive relationships with others.